A summer night releases the romantic, sultry perfume of night blooming jasmine, a favorite fragrance shrub for home landscapes in South Florida. The cascading clusters of tiny tubular flowers are cream colored - not particularly showy but they pack a wallop of scent when they open at dusk. The fragrance is present but much lighter during the daytime hours. Though not a true jasmine, this plant's strong fragrance is legend among fragrant plant lovers. 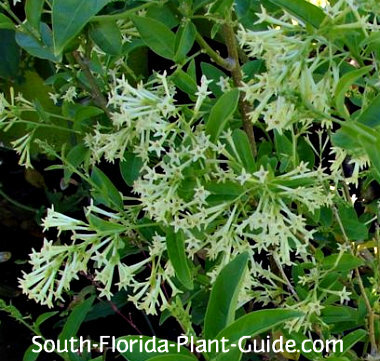 However, don't overdo it - with this or any other sweet smelling plants. Some people find the smell overwhelming. Just one of these fragrant shrubs in a landscape is enough. This plant does best in a sunny spot, with an informal look that works well in tropical or cottage-garden styles of landscaping - or it can soften the look of a more manicured yard. It flowers on and off all year - more in warmer months - with small white berries appearing after the bloom cycle. Note: The leaves, flowers and berries all contain toxins...avoid planting where pets (dogs are especially vulnerable) or young children might munch. This is a fast grower that prefers full to part sun, though it will grow in partial shade (but flowers less). Tropical by nature, these night blooming plants do best in Zone 10. Though they're evergreen, during a harsh winter they may drop leaves. You can grow it in a container in Zone 9B to bring indoors during cold snaps. Some people have luck growing this shrub in the ground in Zone 9B, saying it dies back in winter but usually comes back in spring. Keep this jasmine shrub trimmed to 3 or 4 feet tall, or let it get a bit larger if you prefer. Trim lightly after a bloom cycle for shape. Do a hard pruning in fall (by mid-October) or spring (late March) to control the plant's size. A regular irrigation schedule - with time to let the plant dry out a bit between waterings - is ideal. Fertilize 3 times a year - in spring, summer, and autumn - with a good quality granular fertilizer. You can also supplement feedings with periodic applications of bone meal and/or liquid fertilizer to promote heavier bloom. Place these shrubs 3 feet apart. Come away from the house 2-1/2 to 3 feet. If you're planting by a door, walk or patio, come out 3 feet or more to give the shrub room to fill out. This plant can be grown in a large container, though it will eventually outgrow the pot. COMPANION PLANT SUGGESTIONS: Plumbago, beautyberry, dwarf oleander, ruella, Burgundy loropetalum, lantana, Panama rose, and sweet potato vine.